Bloodlines and DNA are important in horse breeding and similarly Melissa Froesch’s 'bloodline' and DNA testifies she’s a fourth generation equine professional. 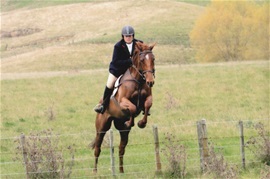 Excellence in horsemanship is practiced by all members of Team Froesch, evidenced in this photo of Melissa hunting a borrowed horse for the frist time in New Zealand, Hunting over a barbed wire fence. Jumping a wire fence might not look like much - but a horse draws from the confidence its senses its rider has and will jump the wire without hesitation. As well as doing showjumping i have also hunted in New Zealand and in the USA with The Midland hunt, Fox River Valley and The Live Oak!! 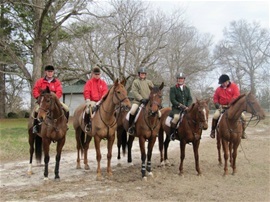 Of course in Australia i hunt with the Findon Harriers Hunt Club and offer a Hunter Livery service for anyone wishing to go hunting that doesn't have the time to work and transport their horse to the hunts Contact Us if you wish to try hunting from May - Mid Sept.